Before becoming an advanced driving instructor (ADI) I worked for over thirty years in educational book supply both as an operations manager recruiting, training and supervising staff and latterly as a sales manager working with finance officers, administrators and teachers in schools and colleges. I took out a trainee licence with BSM as part of my qualification process and during this period successfully guided many of my pupils through their driving test. 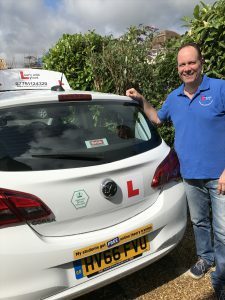 Upon qualifying I decided to become an independent driving instructor rather than work as a franchisee for a national driving school giving me the opportunity to set some of the most competitive rates in the area. Lessons start at just £25 per hour with my pupils receiving free access to Theory Test resources, learner videos and printed lesson handouts. I normally work Monday through to Saturday and occasional Sundays. I love to talk to people, teaching and delivering new skills in a simple and concise manner. Although driving a car should be a safe, exciting and rewarding experience bringing with it clear responsibilities to other road users, my lessons are conducted in a relaxed atmosphere. Learning to drive needs to be taken seriously but there is always time for a little humour along the way.